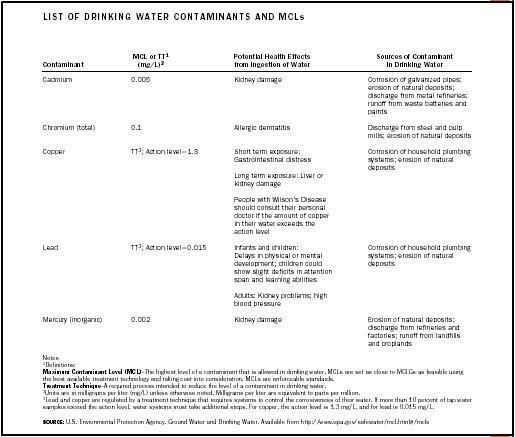 Maximum Contaminant Level (MCL) –The highest level of a contaminant that is allowed in drinking water. MCLs are set as close to MCLGs as feasible using the best available treatment technology and taking cost into consideration. MCLs are enforceable standards. Treatment Technique –A required process intended to reduce the level of a contaminant in drinking water. 3 Lead and copper are regulated by a treatment technique that requires systems to control the corrosiveness of their water. If more than 10 percent of tap water samples exceed the action level, water systems must take additional steps. For copper, the action level is 1.3 mg/L, and for lead is 0.015 mg/L. vitamin B 12 . It is possible to be deficient in these metals, or to have an optimal or a damaging or lethal intake. However, nonessential elements such as chromium, lead, and mercury have little or no beneficial role in the human body, and the daily intake of these metals is often toxic or lethal. Many heavy metals cause nervous-system damage, with resulting learning disorders in children. Ingestion of mercury can cause the severe breakdown of the nervous system, and metals such as lead and nickel can cause autoimmune reactions. Chromium occurs in a relatively harmless form and a much more dangerous, oxidized hexavalent form. Several studies have shown that chromium (VI) compounds can increase the risk of lung cancer and that ingesting large amounts of chromium (VI) can cause stomach upsets and ulcers, convulsions, kidney and liver damage, and even death, according to the Agency for Toxic Substances and Disease Registry. The dangers of hexa-valent chromium in drinking water were popularized in the movie Erin Brockovich. Many fish are very sensitive to heavy-metal pollution. For example, trout cannot live in waters that contain more than about five parts per billion of copper. Heavy-metal contamination is very widespread, especially lead and mercury. Most heavy-metal contamination stems from high-temperature combustion sources, such as coal-fired power plants and solid-waste incinerators. Local metal sources may include metal-plating industries and other metal industries. The use of leaded gasoline has led to global lead pollution even in the most pristine environments, from arctic ice fields to alpine glaciers. The metal fluxes from point sources have been strictly regulated, and the introduction of unleaded gasoline has taken a major lead source away. Several sites with severe heavy-metal pollution have become Superfund sites, most of them still under study for decontamination. Site decontamination can be done with large-scale soil removal and metal stripping, or through more gradual methods, like phytoremediation. Nonetheless, even today metals are delivered from the atmosphere to the landscape. In the United States, drinking water is monitored for heavy metals to ensure that their concentration falls below the safe limit or maximum contaminant level (MCL) set by the Environmental Protection Agency. Many urban estuaries like Boston Harbor, San Francisco Bay, and Long Island Sound are severely contaminated with heavy metals. These sedimentary basins will remain polluted for decades, and a small percentage of the sediment-bound metals is released back into the water and occasionally transformed into more dangerous forms. SEE ALSO A RSENIC ; H EALTH , H UMAN ; L EAD ; M ERCURY ; R ISK ; S UPERFUND . U.S. Department of Labor, Occupational Safety and Health Administration. "Safety and Health Topics: Toxic Metals." Available from http://www.osha-slc.gov/SLTC/metalsheavy .